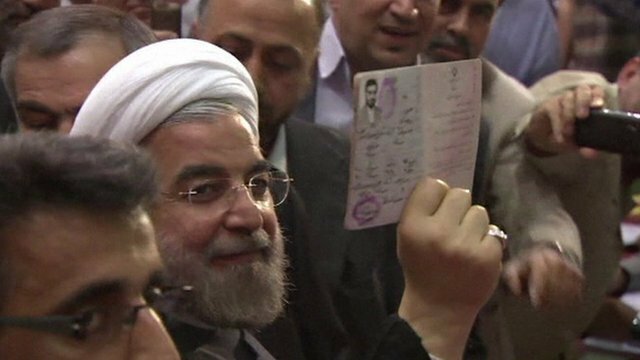 Iran’s presidential election initial count put the reformist-backed candidate, Hassan Rouhani, in the lead. Official figures give Hassan Rouhani 51% of the five million ballots counted so far – well ahead of second-placed Tehran mayor Mohammad Baqer Qalibaf on 17%. If Hassan Rouhani maintains that margin, he will be able to avoid a run-off vote. Electoral officials said turnout was high among the 50 million Iranians eligible to vote on Friday for a successor to Mahmoud Ahmadinejad. Mahmoud Ahmadinejad’s eight years in power have been characterized by economic turmoil and Western sanctions against Iran over its nuclear programme. The interior ministry began releasing preliminary figures early on Saturday after a delay of several hours. Voting was extended until 23:00 local time on Friday to allow more people to cast their ballots. Iranian Press TV reported that turnout was 80%. It is unclear when the final results will be known. Although all six candidates are seen as conservatives, analysts say Hassan Rouhani – a 64-year-old cleric often described as “moderate” who has held several parliamentary posts and served as chief nuclear negotiator – has been reaching out to reformists in recent days. The surge of support for him came after Mohammad Reza Aref, the only reformist candidate in the race, announced on Tuesday that he was withdrawing on the advice of pro-reform ex-President Mohammad Khatami. Hassan Rouhani therefore went into polling day with the endorsement of two ex-presidents – Mohammad Khatami and Akbar Hashemi Rafsanjani, who was disqualified from the race by the powerful Guardian Council, a 12-member body of theologians and jurists. However, Hassan Rouhani faced a tough challenge from hard-line candidates, including Mohammad Baqer Qalibaf – who is seen as a pragmatic conservative – and nuclear negotiator Saeed Jalili – who is said to be very close to the Supreme Leader, Ayatollah Ali Khamenei. The other three candidates are Mohsen Rezai, a former head of the powerful Revolutionary Guards, former Foreign Minister Ali Akbar Velayati, and former Telecommunications Minister Mohammad Gharazi. As polls closed, representatives of all six candidates issued a joint statement urging their supporters to remain calm until the official results were known. “We ask people not to pay attention to rumors of victory parades being organized and to avoid gathering before the official results,” the statement said. Earlier, Interior Minister Mostafa Mohammad Najjar told state TV that any presidential candidates unhappy with the results would have three days to lodge complaints to the Guardian Council. President Mahmoud Ahmadinejad cast his ballot in Tehran accompanied by Vice-President Mohammad Reza Rahimi and government spokesman Gholam Hoseyn Elham, Fars news agency reported. Who is Wendi Deng Murdoch?